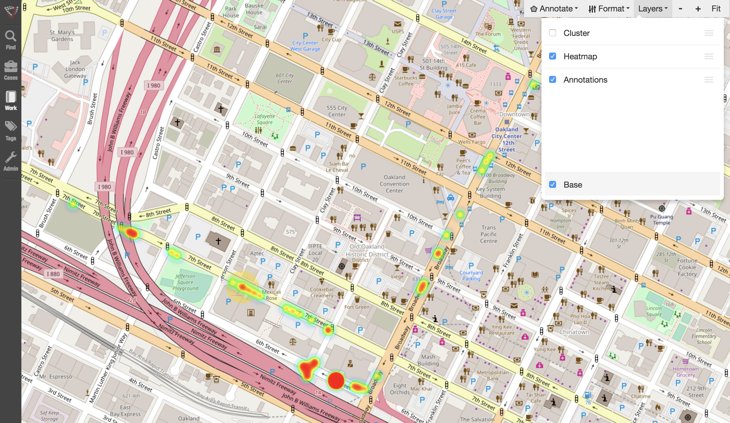 Geospatial analysis is an important feature of an investigative analytics platform, second only to link analysis. Geographic location complements nearly every other type of data and is often key to gaining a complete understanding of an investigation. That’s why it’s critical that your investigative analytics solution provide a strong geospatial analysis capability. Building on the theme of our earlier link analysis post, this article will describe how Visallo assists analysts with geospatial analysis. 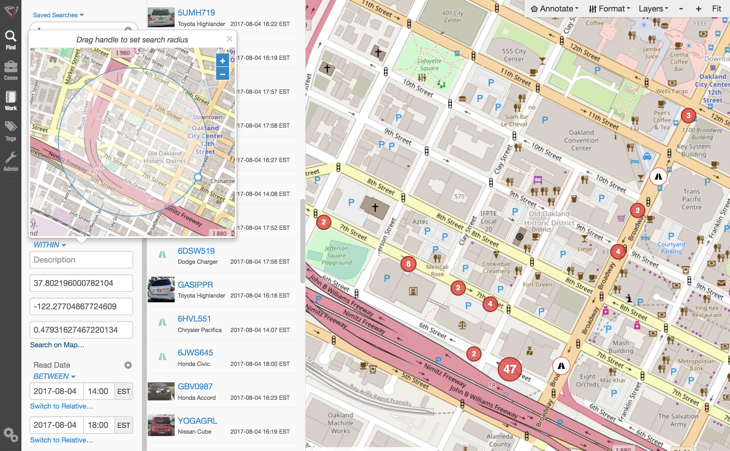 Visallo’s geospatial capabilities incorporate a technology called OpenLayers, allowing us to use maps from a wide variety of providers, including popular ones like ESRI, Mapbox, Carto, Bing, Open Street Maps, Stamen, and more. Leveraging the maps from these providers, Visallo adds the following five core features you’d expect from an advanced geospatial information system. At times, the only thing you may have to start your investigation is a notion of something occurring at a specific location. Asking users to memorize or lookup geo-coordinates in order to search is a non-starter. Visallo simplifies an analyst’s work by allowing them to visually search directly on a map view, or by entering a specific latitude, longitude, and radius if they’re known. Like graphs, maps can become visually overloaded when displaying copious amounts of geo-located data. Visallo smartly and automatically clusters collections of pins in close proximity rather than displaying them as an overlapping pile. As you zoom in, clusters break out into individual pins as the visual space becomes large enough to prevent overlapping. Again, all of this is transparent to you. 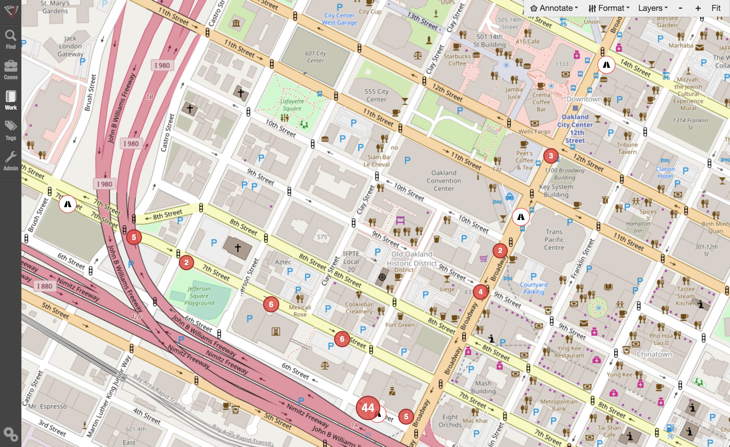 You just get a clean, easy-to-understand view of large quantities of geographic information. 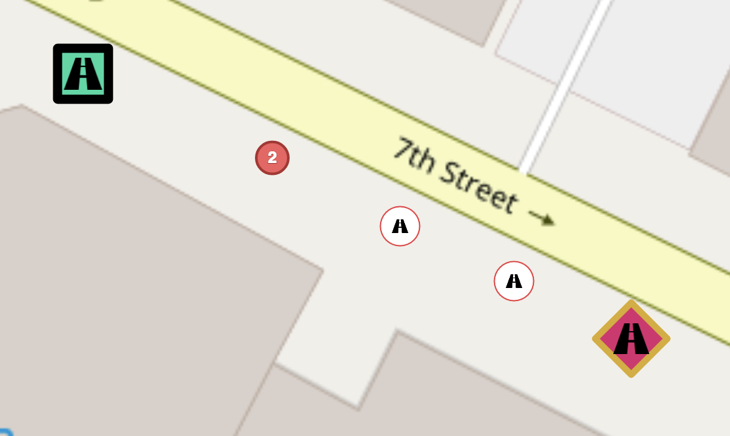 Maps can quickly grow obtuse as the number of pins increases. Without additional context, it’s often very difficult for outsiders to understand the analysis. A good investigative analytics platform will recognize this and provide tools to help mitigate the problem. 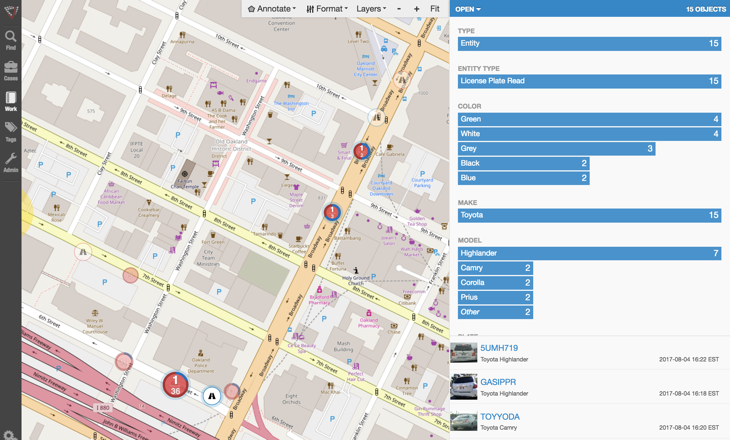 Visallo provides the ability to easily format the entities and relationships on your maps. Changing their opacity, size, color, shape, background color, border size, border color, and more is simplified, making it easy to focus on the most important data. 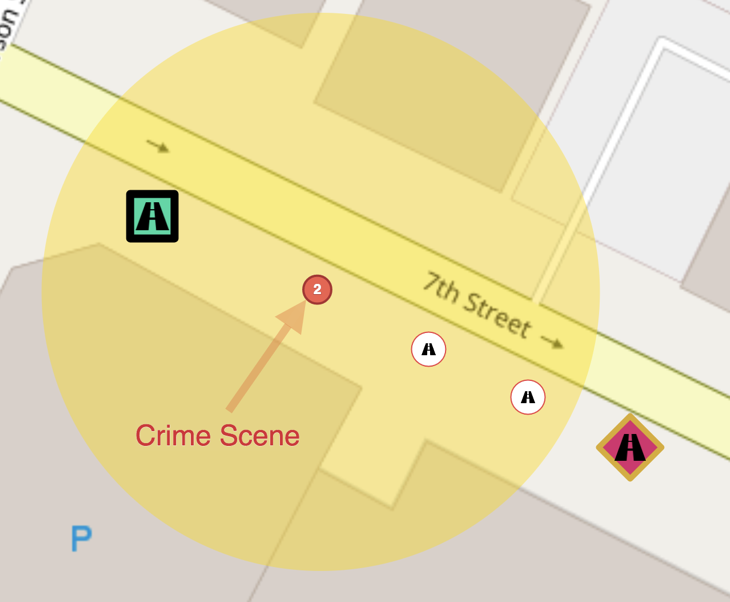 You can also add a variety of annotations to your maps to clarify points and draw attention to important aspects of your analysis. Add shapes, change their opacity, background color, border size, border color, etc. Text labels can also be added. Most modern geospatial information systems display maps as a stack of layers that build upon one another, and Visallo is no exception. Visallo ships with several layers by default, and custom ones can be added by importing Keyhole Markup Language (KML) or GeoJSON files. Each layer can be toggled on and off and reordered to show certain layers above or below others. The layered structure provides you with significant map display and usage flexibility. Finding a given entity becomes difficult as the number of pins on your map increases, yet this context is critical to an analyst’s work. Visallo’s map provides additional context upon hovering over values in the histogram. When doing so, pins or clusters that do not contain a property value corresponding to the item being hovered above will change to being mostly transparent. However, pins and clusters that do have matching property values will be highlighted. Additionally, clusters whose member pins don’t all have matching property values will be displayed as a fraction, indicating how many members in the cluster contain the property value. As in link analysis, real-world geospatial analysis is more complicated than it first appears, with much of the difficulty presenting itself at larger scales. While the five features described in this post are not an exhaustive list for making your geospatial analysis more productive, they certainly make the analyst’s work less laborious.